Immigration and refugee resettlement will take center stage Feb. 6 at the third annual symposium hosted by the Leadership and Multifaith Program, a collaboration between Emory's Candler School of Theology and Georgia Tech's Ivan Allen College of Liberal Arts. Issues of immigration and refugee resettlement will take center stage at the third annual symposium hosted by the Leadership and Multifaith Program, a collaborative endeavor between Candler School of Theology and the Ivan Allen College of Liberal Arts at Georgia Institute of Technology. 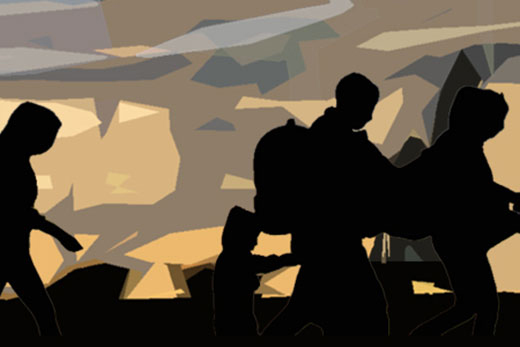 “Asylum, Refuge, and Relocation: Multifaith and Community Responses to Global Migration” will take place on Monday, Feb. 6, from 9:30 a.m. to 6:30 p.m. at Georgia Tech’s Historic Academy of Medicine. Derreck Kayongo, CEO of the Center for Civil and Human Rights, will present the keynote address, “How the Legal Power of Protecting Rights Expands the Marketplace.” The keynote respondent will be Silas Allard 11T, associate director of Emory’s Center for the Study of Law and Religion and Howard J. Berman Senior Fellow in Law and Religion. Deanna F. Womack, assistant professor of history of religions and multifaith relations at Candler, notes that this year’s symposium examines a central issue of concern for Atlanta’s religious congregations and community leaders. “How can we best respond to the needs of immigrants and refugees in our own society, and assist displaced people around the world? Our team of speakers will address this question from a variety of local and global perspectives,” she says. The symposium will begin with a film screening and discussion with Ellen Martinez and Stephanie Ching, the directors of "After Spring," a documentary on the Syrian refugee crisis executively produced by Jon Stewart. Two afternoon sessions will each offer four workshop options on a variety of issues surrounding migrants and refugees. Topics range from educating immigrant and refugee students to working with detained asylum seekers. The latter will be led by Candler’s Scholar-in-Residence Marie Marquardt, while a workshop on spiritual care with migrants and refugees will be co-led by Emmanuel Y. Lartey, L. Bevel Jones III Professor of Pastoral Theology, Care and Counseling at Candler. Womack says the symposium will not only raise public awareness of the issues refugees face, but outline how concerned people can help address these issues. “This event will provide participants with tools to face contemporary challenges with hope as they take action on behalf of the immigrants and refugees who call America home," she explains.